Learn how to customize how events display in charts. Examining events directly in charts can help you correlate metric anomalies with the events. This page explains how you can display an event overlay with details about the event, and customize the overlay. The example below shows an event overlay that includes a link to the alert that generated it and other information about the event. If a single event occurs in a time interval, the event icon displays as a dot on the chart’s X-axis. If two or more events occur in a time interval, the event icon displays as a star on the X-axis. Instantaneous events display a vertical line and non-instantaneous or ongoing events display a shaded region that represents the duration of the event. Select the Display Source Events check box in the chart configuration General options to display events related to alerts that fired for sources that display in the chart. 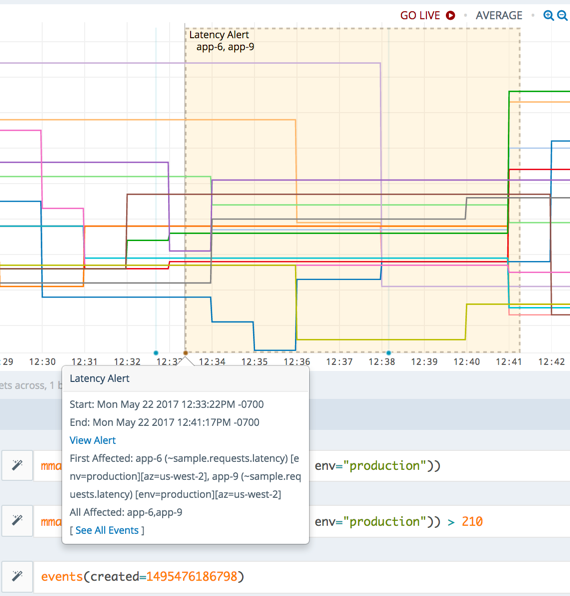 Add an events() query to the chart. 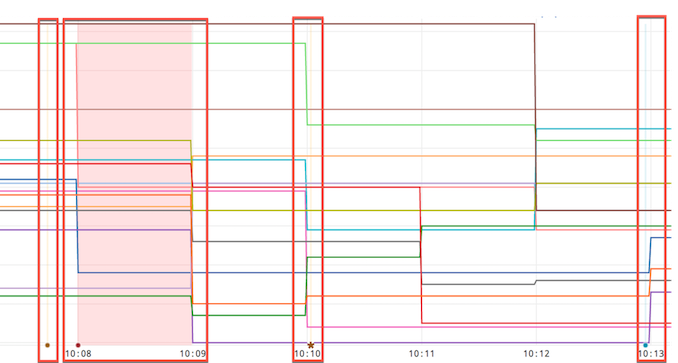 An events() query cannot be the only query on a chart. At least one ts() query must be enabled on the chart so that the events() query results display. Set an events() query in dashboard preferences, which you can access from the wrench icon in the right corner of the time bar. From Chart - Displays events based on the selection of the Display Source Events checkbox. Default setting. From Dashboard Prefs - Displays events based on the events() query set in the dashboard preferences. Forces the Display Source Events checkbox off. From Chart & Dashboard- Displays events based on the selection of the Display Source Events checkbox and the global events() query. Related Source Alerts - Selects the Display Source Events checkbox. All - Displays all events that have occurred within the time window associated with the chart windows. None - Hides all events from every chart in the dashboard.